Let’s face it. Sitting around the camp fire with close friends and family is one of those treats for which everyone should make time. Personally, I like to add a little bit of my favorite Bourbon to the ritual to maximize enjoyment. 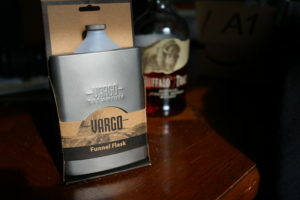 On nights after an excellent adventure, I always keep something to help me relax in my Vargo Titanium flask. History: Why Are Flasks Curved? Flasks have been around for decades. Thought to have origins in Europe, flasks started as a larger canteen like vessels made from leather. In the 1800’s it is said that Masonic members were gathering in local dwellings after meetings needed to bring their liquor. Being craftsman they began by making a small glass container. The long neck design made it easier to drink. The addition of a curve enabled it to be discretely concealed in pockets or pouches. Often the Masonic groups etched their markings as a showing of membership. As this tradition evolved, works of art and busts of the American heroes and leaders came to emblazon their custom faces. In addition to glass, early designers began using metals. Silver was the most popular in the beginning as it was believed that silver added valuable mineral properties to your whiskey. During the 1920’s prohibition made the flask a staple, solidifying its place in history. The flask became a common purse-mate for Americans. It was being carried as a daily accessory by both men and women throughout the country. As regulations against the legal production, sale, and possession of alcohol ramped up, hiding booze became of the utmost importance. Born of that era, the saying “Bootleg” came from the act of hiding flasks in one’s boot, something which still done today. In the 1930’s, after prohibition, the flask was then used by sports goers before the phrase “BEER HERE” was echoed in ball parks. Glass has become less popular due to its brittle nature, so metal flasks have become the norm. Stainless steel, pewter, copper, and titanium have all bid for the best choice for your hooch. In the past, I have owned stainless steel and bulky plastic flasks. Disliking the tendency of steel to leave a metallic taste in your mouth and the cheap feel of plastic has led me to embrace a newcomer. For this article, the kind folks at Vargo are letting me review their Titanium Funnel Flask. The rustic packaging gives a love at first sight appeal. 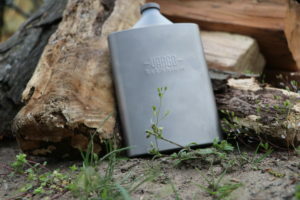 The darker gray colored titanium makes this flask look aged while still light weight. The Funnel Flask is a wise trail choice for those pack minded hikers.The discrete company name brandished on the front maintains the history of subtlety and class associated with flasks. 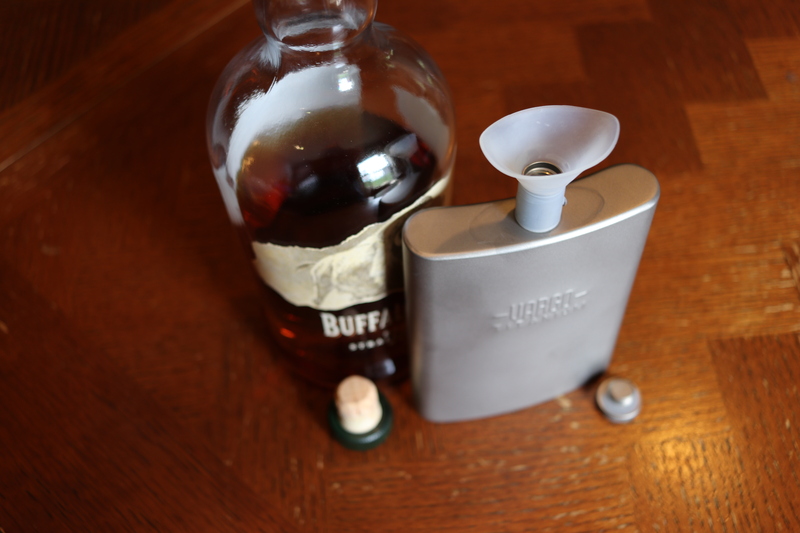 The easy-store funnel makes for an easy fill and comfortable sipping alike. Titanium leaves your alcohol untainted as long as it’s cleaned regularly. My only concern is the detached cap. I have a feeling that some of you may find yourselves searching the campsite in the morning for this piece of gear after your glass of bourbon. This entry was posted in Our Gear and tagged flask, flasks, funnel flask, stainless steel, titanium flask. Bookmark the permalink.